Lots of trees, and small annoying OB creek. Mix of long and short with varied elevation. Some technical throws and several long drives. Multiple concrete tee pads on most holes. Bring the map to combat confusing navigation. N.E. Loop 820, exit Hwy 377 (Denton Hwy). Go north, park entrance 0.12 mile on right. Fun course with many technical shots through trees. Make sure u download the course map as the holes and tee boxes are poorly marked. Update: The first time I played this course I hated it and gave it a 2 star review. I have since played it a few times and it's now one of my favorite courses. A fun mix of challenging technical shots and a few wide open holes. While it can be frustrating when you bounce off the trees, it's also very rewarding when you fly right through them. The only water on the course is a small stream flowing through it that's never more than an inch or two deep and a foot or two wide. While it may be OB, you're not going to lose a disc in the water. Two tee boxes for each hole for normal and challenging play. Two basket positions (A and B) for a variety of game play. Depending on when you go, the grass can get a little out of control. Even after mowing, there are still parts of the course with tall grass that makes it hard to find even good shots sometimes. Lots of trees means lots of dings in your discs. Don't throw something you don't want getting knocked up. Because of the heavy shade, parts of the course stay wet and swampy for several days after a heavy rain. Like most courses, the layout can be confusing at first, but each basket has a spoke painted to point you toward the next tee box. Once you learn the course, it's no problem. Very confusing course. I couldn't figure out layout of course. It seemed like the baskets changed after hole three. Tee boxes were not marked besides #1. From what I could tell, course is open for at least the first 7 holes. After I walked them, I was too frustrated to continue trying to figure out the course. Whoever is taking care of this course, please post a layout on post board by hole one, or make the tees better!! Played this course for the first time today. I grew up in Haltom City and wish this would have been here years ago! Overall the course is a good mix of technical holes with some good wide open long-drive holes. Trees will play into your game in all holes from 1 to 12, then on 13 to 16 you will get to open up and show what you have for a long drive, especially on 13's 560' fairway! The course is very confusing for new players and I would recommend you print and take a copy of the map with you because signage is minimum. Construction on the course caused some confusion but it's still quite playable. The cage is missing on 4 but you can just add a little extra challenge and play to the cage on 6. !! !POISON IVY WARNING!!! There is rampant poison ivy in the tree lines of this course. 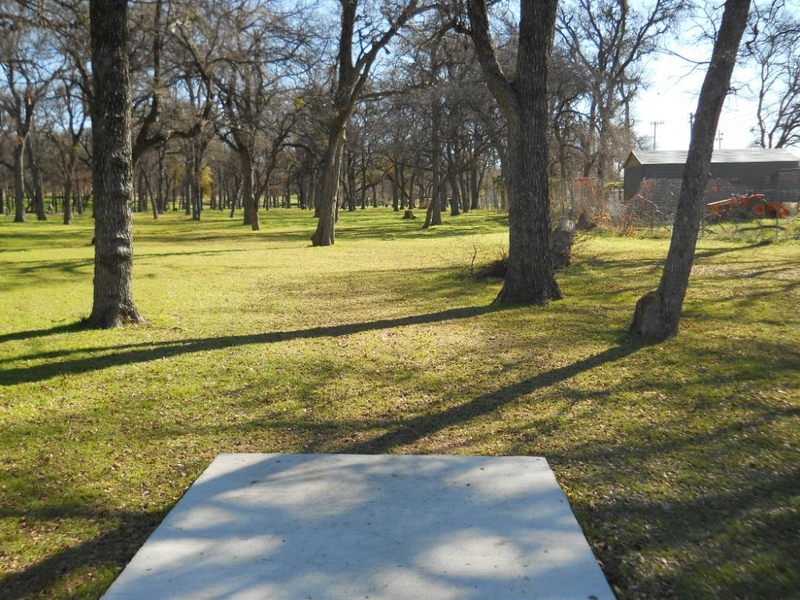 Be very cautious if you have to fish a disc near the base of a tree. In a few spots, the ivy spread out near the t-boxes and fairways. Familiarize yourself with the plant and you can avoid it. Update On 7-21-10 I just got to play this course for the first time in months. All the gas well equipment is gone and except for the basket missing on hole 4 it is totaly open. A crew was mowing the grass and talking about trimming trees when they finished. They have even planted grass in the areas that is dirt. Maybe we can get the pratice basket that is by hole one moved to hole four then it would be as good as ever. Get out there and fly on all who love this nice little course. Had high hopes for this course. Everyone that I have talked to said that this course was great....then they destroyed it with construction and there is no reason to waste your time. 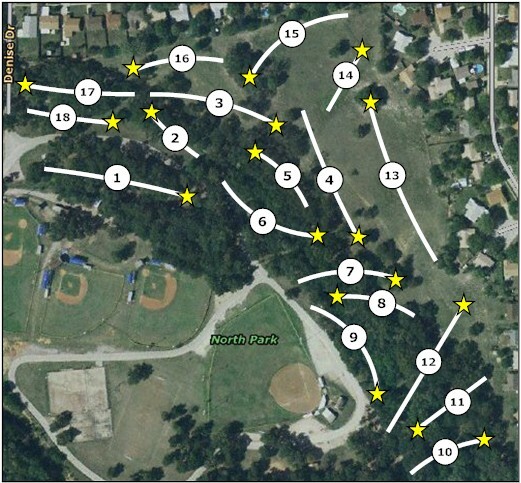 Thank you City of Haltom for ruining one of my favorite, easily accessible courses with your natural gas drilling. I learned alot and actually got better by playing this technical course, with varied hole locations and... oh, the trees. They actually began adding nice concrete tees boxes to some of the holes... all for not. What a waste!! Nice course hevily treed for most of it. The holes are laided out well, the only problem is navigation of the course for new comers.